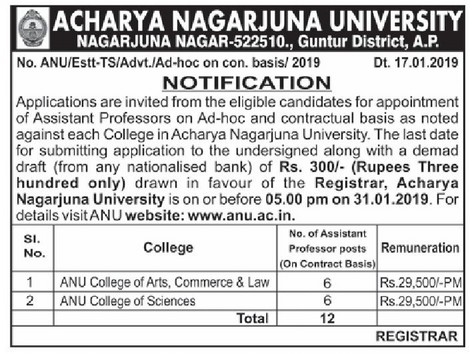 Acharya Nagarjuna University, Guntur has advertised in the EENADU newspaper for the recruitment of Teaching Faculty- Assistant Professor jobs vacancies. Interested and eligible job aspirants are requested to apply on or before 31st January 2019 . Check out further more details below. University Profile: Acharya Nagarjuna University has completed three decades of its existence. It was inaugurated on 11th September, 1976 by the former President of India, Sri Fakruddin Ali Ahmed. There have been many problems, difficulties and teething problems in its onward march. In the course of the last 30 years, the University has successfully overcome most of the initial problems and is moving forward with determination, enthusiasm and hope. From the corridors of a local polytechnic college in Nallapadu to the imposing buildings in Nagarjuna nagar, the road was very long. Sacrifice, service and commitment marked the growth of Acharya Nagarjuna University. Application Fee: Demand Draft for Rs.300/- drawn in favour of the Registrar, Acharya Nagarjuna University. How to Apply: The candidates are requested to send application in prescribed format downloaded from university website along with their copies of certificates, Aadhaar card, PAN card and recent PP size photos to the postal address provided below.